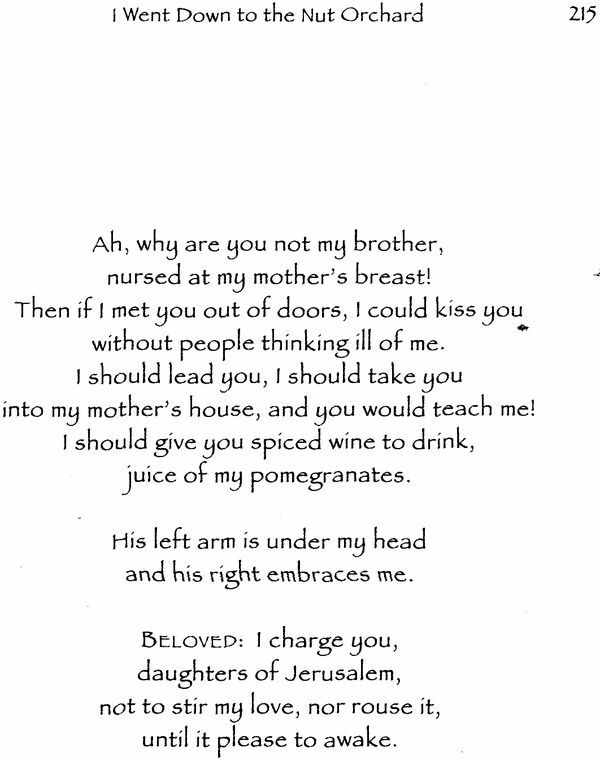 On the face of it, the biblical Song of Songs tells the tale of a passionate and worldly love. Yet it contains not one word that speaks explicitly of God or spirituality, though the Song was accepted long ago into both the Jewish and Christian scriptural canons. In this enthralling book, John Davidson brings out the spiritual meaning of one of the most intriguing books in the Bible. 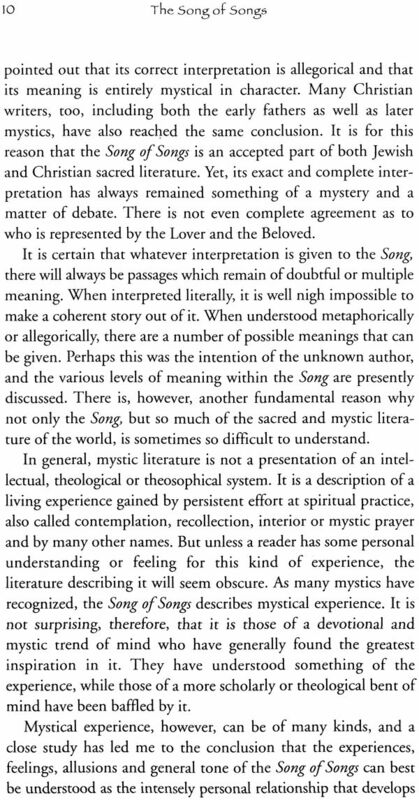 Over the centuries, both Jewish and Christian.mystics have agreed that the Song should be understood allegorically, not literally - in keeping with the widespread use of metaphor, parable and story among the poets and mystics of the ancient Middle East. Even so, there is only partial agreement regarding the allegorical interpretation of its multitude of colourful and varied images. From the perspective of a universal spirituality, John Davidson sheds light on many of the Song's obscure passages, uncovering the artistry of its unknown poet. Little by little, the Song oJ Songs is revealed as a key to the language of metaphor, common throughout the mystic literature of ancient times. 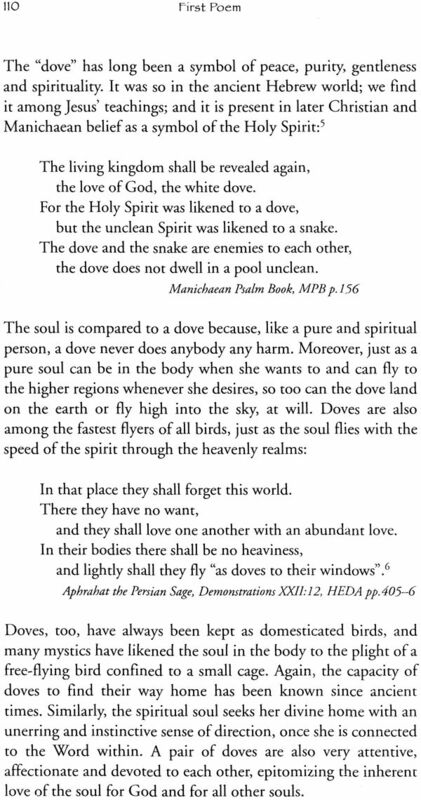 The commentary is illuminated by passages from biblical texts and other spiritual literature, including the teachings of Jesus, gnostic writings, Jewish and Christian mystics, and some of the ecstatic psalms found among the Dead Sea Scrolls. Born in 1944, John Davidson has had a lifelong interest in mysticism. Graduating in 1966 from Cambridge University with an honours degree in natural sciences, he worked for seventeen years at the University's Department of Applied Mathematics and Theoretical Physics. In 1984 he left the University to pursue independent interests, and since then has written a number of books, including a series on science and mysticism. The present book is the fifth in a series on science and mysticism. The present book is the Fifth in a series on Christian origins, following on from his ground breaking work, The Gospel of Jesus: In Search of His Original Teachings. 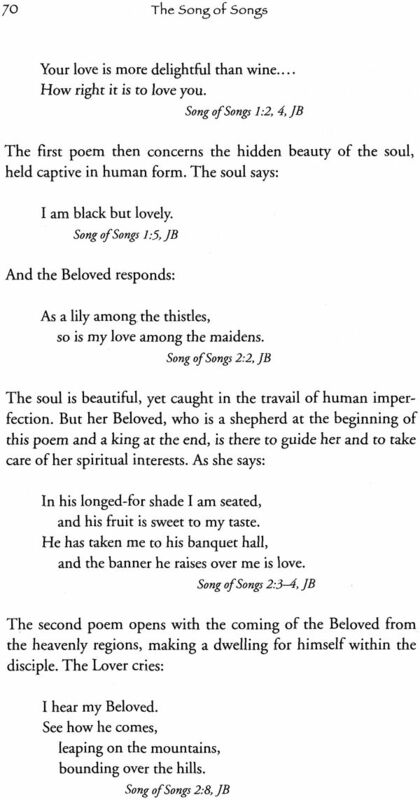 The Song of Songs is the third in a series of three books concerned with the interpretation of ancient parables and allegories from biblical and early Christian times. 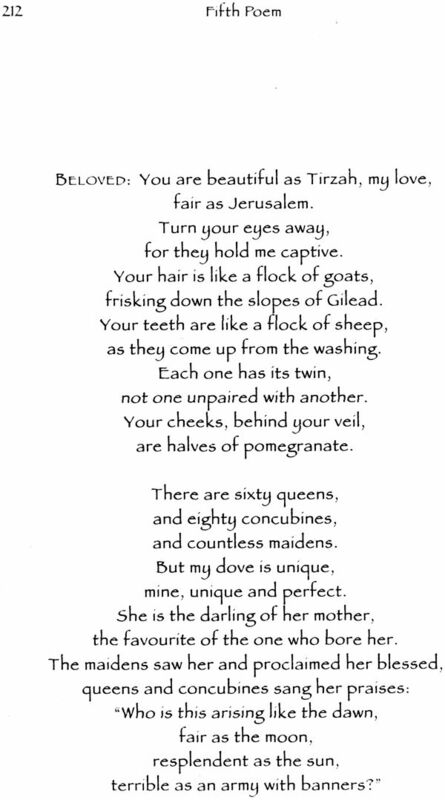 Following on from The Prodigal Soul and The Divine Romance, it consists of an introduction to and an allegorical, mystical interpretation of the biblical Song of Songs, a suite of interlinking poems also called Canticles or the Song of Solomon. 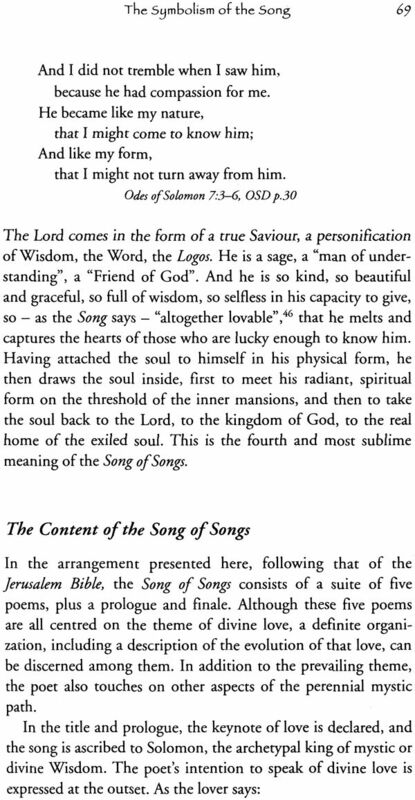 The Song of Songs is characterized by its colourful and ample imagery. However it is interpreted, no one denies that this is so. In fact, the meaning given to the Song as a whole is determined by the interpretation of its many metaphors and allusions. But such imagery can be understood in many ways. It seems appropriate therefore, to provide some support for the mystical interpretation suggested. Help is certainly at hand, for the metaphors found in the Song have been used extensively in the mystic literature of the ancient Middle East, where their meaning is often more explicit. 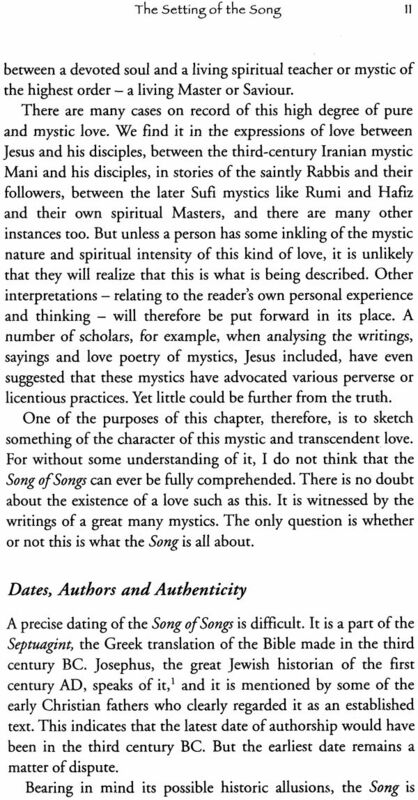 There are also a great many references to and a number of full- scale commentaries on the Song of Songs by Jewish and Christian mystics. All these greatly aid our understanding and reinforce the mystical point of view. But how to convey this information in a concise and digestible fashion, so as to impart confidence that the interpretation has a secure foundation? My primary aim is to bring out the spiritual meaning of this suite of poems for the ordinary reader, and to convey something of its beauty. Bearing this in mind, I have kept the commentary as simple as possible, interweaving it with supporting passages from other sources. Many of these quotations are simply too beautiful or too pertinent to omit. Two introductory chapters are also provided to help set the scene. 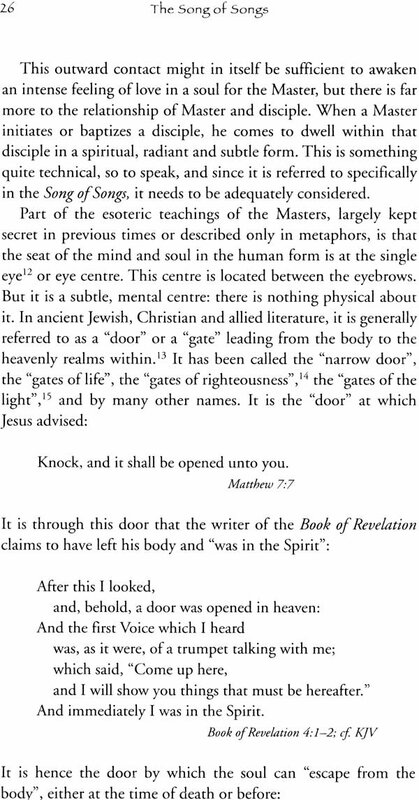 Those wanting an even more complete picture of ancient mystic metaphor could refer to my more extensive, The Gospel of Jesus: In Search of His Original Teachings, along with two books on ancient parables and allegories (The Prodigal Soul and The Divine Romance), and another containing the collection of early Christian mystical poems known as The Odes of Solomon. Numerous examples are given in these books that further illuminate the meaning of the metaphorical language of mysticism in the ancient Middle East. 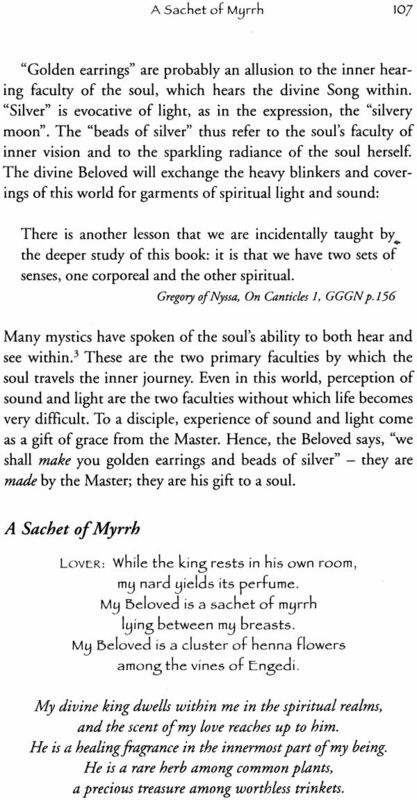 Anyone wanting to delve even more extensively into the mystical terminology of the world's spiritual and religious traditions, could try the multivolume, A Treasury of Mystic Terms. An interpretation of poetry and an attempt to uncover its meaning is not an exact science. Science attempts to define meaning; poetry suggests or conveys meaning, often at a variety of 'levels', simultaneously. In the case of the Song, this meaning is rich and abundant. This is the power of metaphor and imagery over rational and philosophical exposition. But it makes the task of the commentator more challenging. For when one meaning is given, it can appear to exclude others, while if an attempt is made to express something of all the meanings, the commentary becomes in danger of taking on the character of an unintelligible bramble bush. In the interests of readability, I have tried to pursue a middle course, but I do not suggest that the whole of the meaning is conveyed by my commentary. 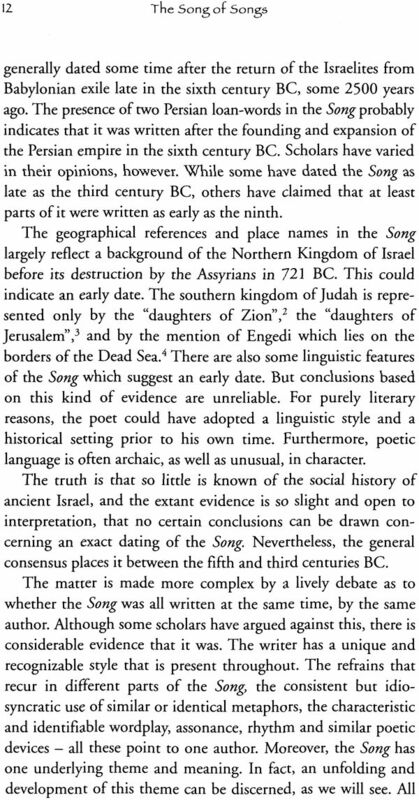 Actually, the meaning lies in the original Hebrew poetry, not in any interpretation or translation, however accurate. In fact, the real meaning lay in the mind and experience of the unknown poet who wrote so long ago. That being so, any commentary can only be considered as a personal interpretation and a guide for readers. If someone has alternative suggestions, then that is to be expected. Among the numerous extant commentaries, there are many variant viewpoints. 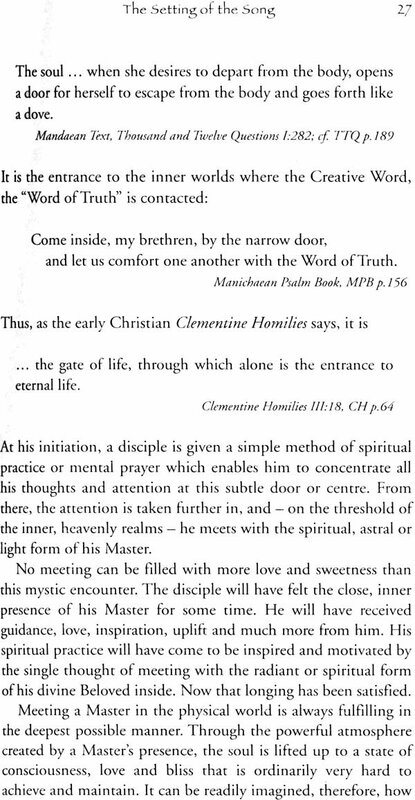 Regarding the supplementary quotations used and their trans- lations, there are occasions when the intended mystic meaning seems clear, but it has not been adequately conveyed. Sometimes, the simple capitalization of a word makes all the difference. 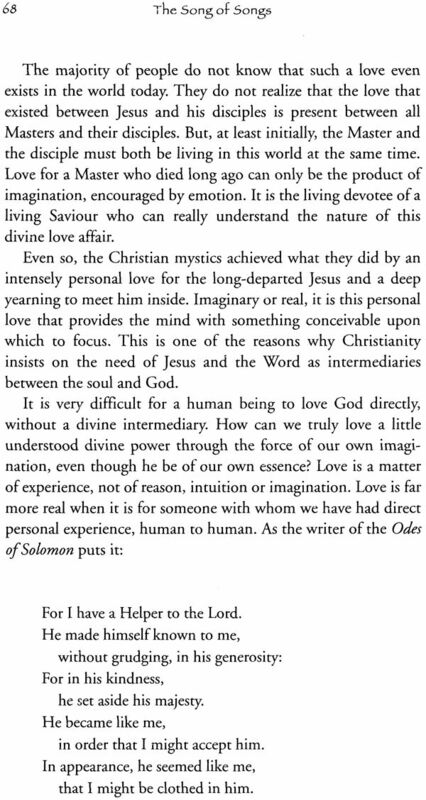 God, for example, could not be expected to have manifested the creation with a human 'word'. But if we write 'Word' - meaning his creative Power or Emanation - we have a statement with which many mystics throughout the ages would agree. In instances of this sort, and where supported by the full context, I have taken the liberty of either very lightly editing the text, or of adding explanatory words in parentheses. I have also tended to modernize old-fashioned English. In a very few cases, where a number of scholarly translations are available of some particular text, I have combined them, indicating this by a reference to the various sources consulted. Also, because of the variety of typographic styles found in the many quotations, I have standardized the layout, as well as the spelling and punctuation. The aim has always been to help convey meaning with clarity, lucidity and simplicity. Any significant clarifications or additions to a translation offered by myself or the original translator have been placed in round brackets, while significant conjectured words or phrases, usually provided by the original translator to fill gaps in an original, defective manuscript, appear in square brackets Where translations used have been edited for any of the above reasons, this is indicated by the use of if. in the source reference. 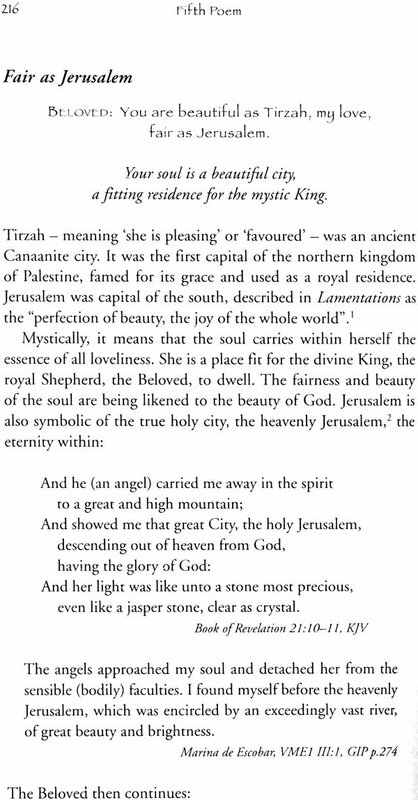 The translation used for the Song of Songs is that of the Jerusalem Bible. 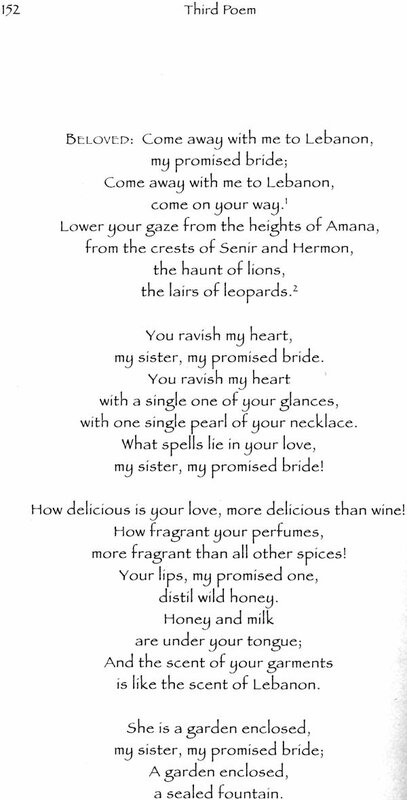 To my mind, this is the most lyrical of all the English versions. 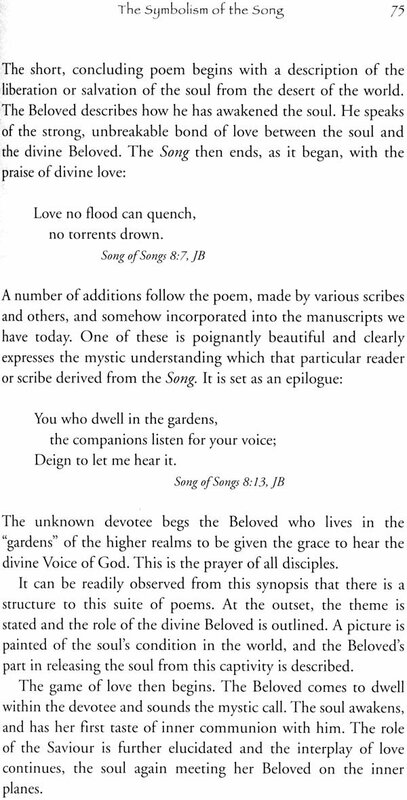 I have also consulted many other references, translations, commentaries and studies of the Song of Songs - some ancient, some modern, some Christian, some Jewish, some interesting, some bizarre, some mystical, some profane. Many of these are listed in the Bibliography. Should the reader feel so inclined, he could therefore pursue his own line of research. 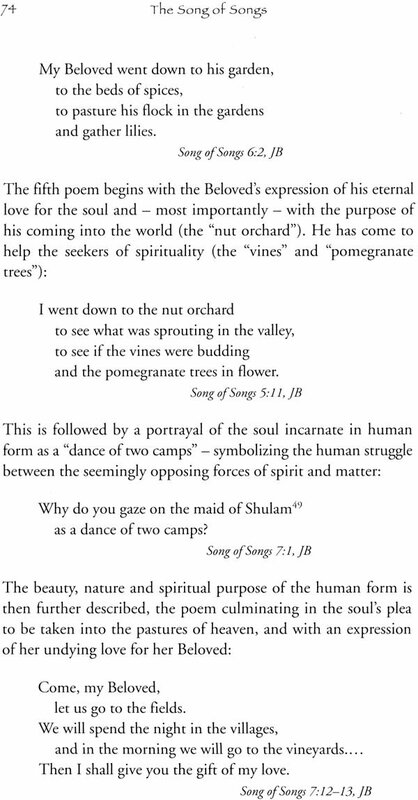 The Song of Songs is set as a dialogue between a Lover and her Beloved, with further additions from a 'chorus' of devotees, as well as from the poet him or herself Few renderings, however, offer any help as to which character is speaking, something which does not always become clear even from a careful study of both the context as well as the original language.' 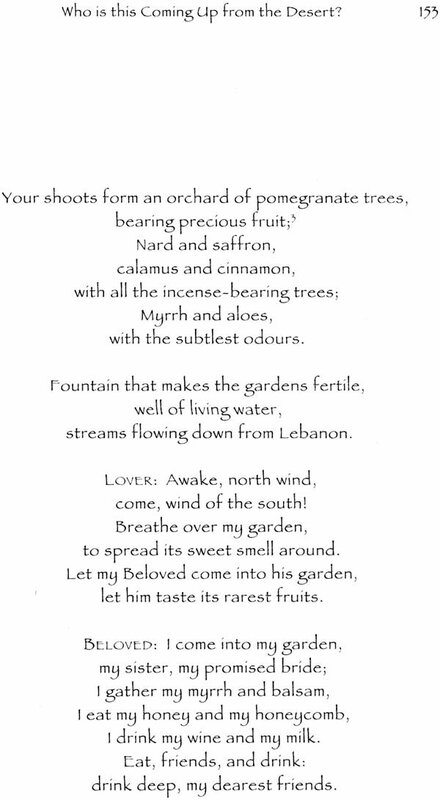 Together with the poem's symbolism, this can sometimes combine to make translated texts more or less impenetrable. The original Hebrew is more helpful since the speaker can often (but not always) be ascertained from the gender of various words. But even then, as becomes clear from a brief discussion of the problem in the Jewish Misbnab,' dating from the late second centuty AD, there was doubt even two thousand years ago as to who was speaking, for a 'he' can easily become a 'she' in transcription or oral transmission. It is not surprising, then, that the various translations and commentaries sometimes differ as to who is speaking, and there is ample precedent for the few instances where I have differed with the translators of the Jerusalem Bible. In the Jerusalem Bible, as a help to the reader, the translators have added the subheadings 'The Bride', 'The Bridegroom' and 'The Chorus'. 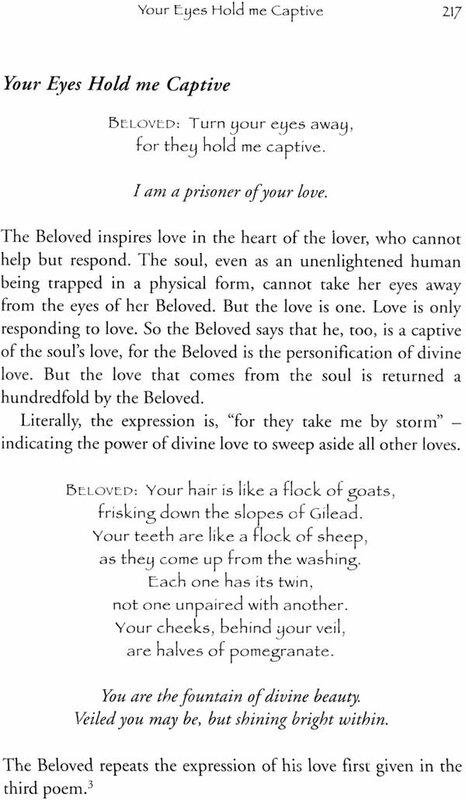 However, they could equally well have used 'The Lover' and 'The Beloved', as in the New Jerusalem Bible and the New English Bible. Being marginally more modern in character, the latter designations have been adopted here. 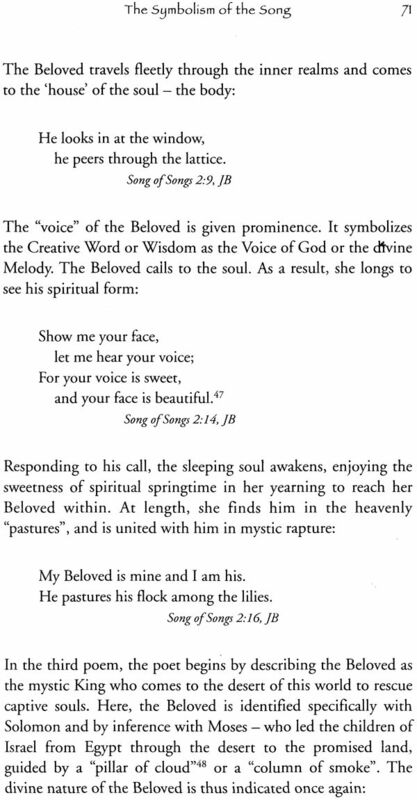 Either way, the metaphors of the Bride or Lover and the Bridegroom or Beloved have been used by mystics of all nationalities and ages to symbolize the love of the soul for the divine Beloved, and any combination would have served the purpose just as well. Human work is rarely perfect. 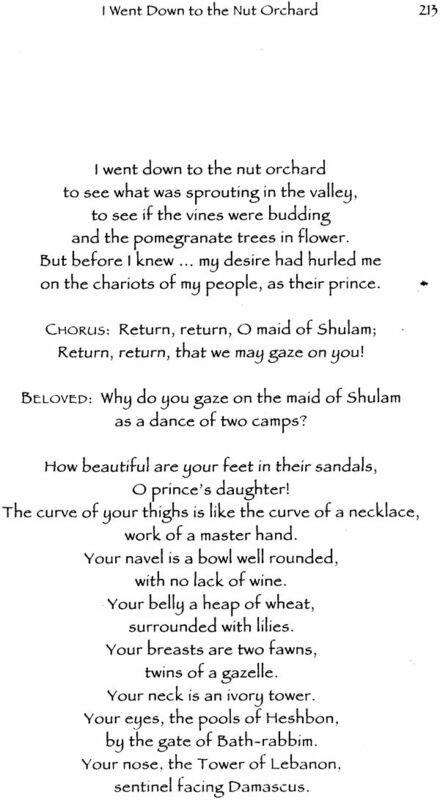 In this instance, the opportunity for error is magnified by the variants and uncertainties of some parts of the Hebrew text, obscurities in both the literal as well as metaphorical meaning of the original language, and the many possibilities suggested to the interpreter by the generous imagery of the Song. 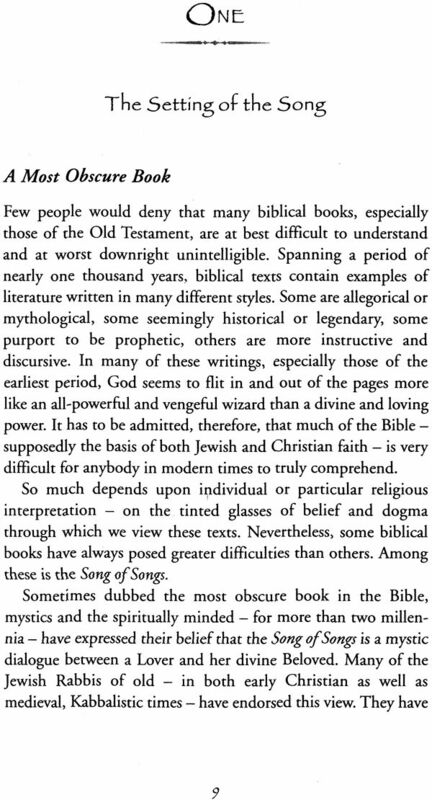 Indeed, there can be no other biblical book which has generated such a wide variety of interpretations and studies. In the last century alone, scholars have produced a wealth of diverse studies, commentaries and translations. During this period, in keeping with modern attitudes concerning the relationship of man and woman, the weight of scholarly opinion has swung away from the allegorical and mystical interpretation. With the exception of some traditional Christian and Jewish interpreters, the Song is now generally seen as a eulogy of human love at a purely physical level. Personally, I think that this is a step in the wrong direction, but it is not my intention to argue the mystical point of view in a philosophical manner. Spirituality is not so much a matter for debate, as for experience and practice. All the same, I have read through a great deal of the scholarly literature, where numerous interesting and illuminating points are raised. Even so, I remain unconvinced by many of the overall conclusions concerning the primary meaning of the Song. But I have no personal axe to grind, either way. 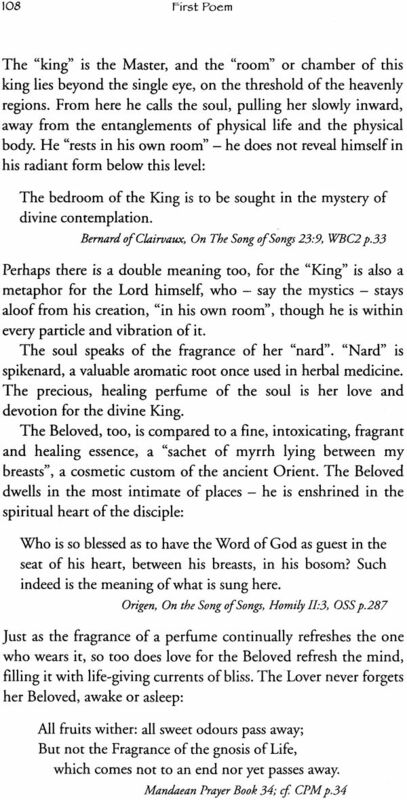 There is no particular underlying reason why I should defend the spiritual character of the Song of Songs. If the Song had struck me as a collection of ancient love lyrics or as a drama of competing human lovers, I would not have written this book. But when I read the Song, its mystical meaning seems to jump out of the pages. 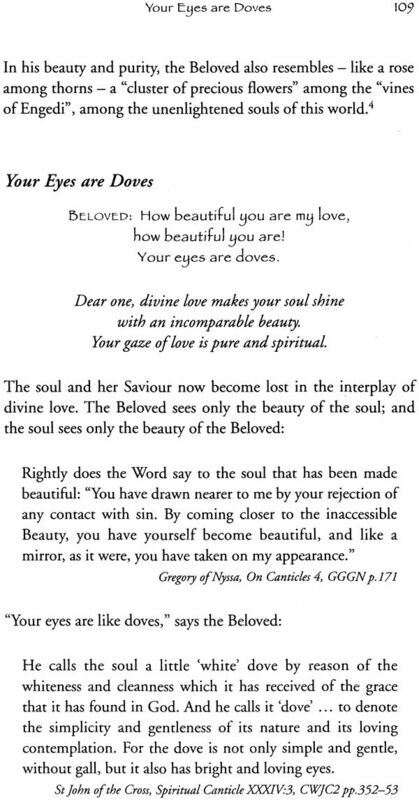 Therefore, I have tried to share something of the beauty and the spiritual meaning that I find in it. I will be happy if some of my readers are similarly inspired.